Evening after the Photography workshop on 6th Dec 2009 I was tired from all the presentation and talk which happened at the workshop. Having taken bulk of the topics and over 8 sessions my throat was aching. We had 32 very nice enthusiastic youngsters who attended the workshop.The interaction was great and we all learned a lot about photography from each other. When I returned to my in-laws place at Bondel, Mangalore, I was eagerly greeted by my daughter who showed this plump green caterpillar which she sighted on the flowering bush in their garden. She had seen the similar caterpillar earlier at her school backyard and wanted to know the identification. There were 3 caterpillars on that Crape jasmine (Tabernaemontana divaricata) plant. They were caterpillars of the of the oleander hawk-moth. The Oleander hawk-moth, Daphnis nerii (Linnaeus, 1758), one of the most widely distributed species of sphingid in the world, is known to occur in Africa, southern Europe, Arabia, Afghanistan, Pakistan, India, Sri Lanka, Myanmar, Nepal, Thailand, Yunnan (south China), Hong Kong, Taiwan, the Philippines, Sumatra, Peninsular Malaysia, and North Borneo, and has been introduced to southern Japan, Hawaii, and Guam. Its vernacular name refers to the oleander, Nerium oleander (family Apocynaceae), on which its larvae feed, among other members in its family of poisonous, laticiferous plants. Incidentally, the Oleander was also first described by renowned Swedish naturalist, Carolus Linnaeus in 1753. I had the great opportunity of photographing this moth earlier which I documented on this website here and here. 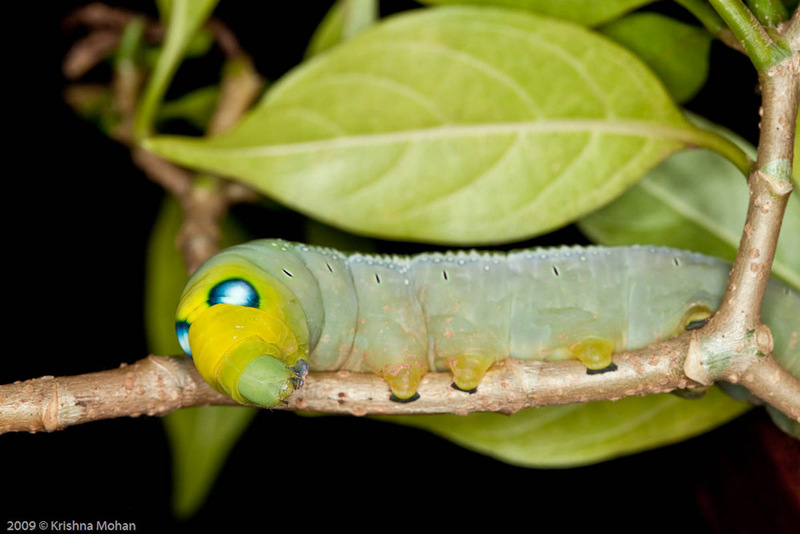 Entire body of this caterpillar was a pleasant apple green, with a straight, dorso-lateral row of small, aqua-marine dots from its second to seventh abdominal segments, with a chalky white, longitudinal band immediately above this. There was also a scattering of distinct, white dots from its first to fifth abdominal segments. Its spiracles were jet black, outlined with white. On its third thoracic segment, there was a prominent pair of ocelli (A marking that resembles an eye), consisting of an outer, Dark Blue ring with a whitish blue center, clearly advertised when its defensive posture (head tucked under) was adopted. Its tail horn was relatively short and had a rounded tip. There was a sparse distribution of low, short spines over the entire tail horn, which was largely citrus-yellow. It was voraciously feeding on Crape jasmine leaves and excreting large greenish black pellets. Since it was dark we decided to visit and photograph it next day. Next day morning when we went to visit the caterpillar again we just couldn’t find any apple green caterpillar. Previously apple-green body had transformed to a dirty orange on the flanks and an olive-brown on the dorsum. A symmetrical pair of round, black patches had also appeared on the top of its first thoracic segment, just posterior to its head. The thick rings of its false eye spots had darkened to a black outline. The yellow of its posterior tail horn had now darker orange. This was pre-pupal metamorphosis of the caterpillar. What we saw yesterday was the final instar version of this caterpillar.As we were observing the caterpillar was descending to the ground. Then it dropped to the ground and started burrowing deep into the soil to pupate. I did not disturb its path and let it continue. In another 10days I was sure it is going to emerge out of its pupa and brilliantly colored oleander hawk moth which I had previously documented on my website. Descriptions and illustrations of the larva and pupa of the oleander hawk-moth were provided previously by Bell & Scott (1937), with more recent works by Pittaway (1993) and Pittaway & Kitching (2009). Throughout its broad geographical distribution, the combined list of documented larval host plants for the oleander hawk-moth comprises no fewer than 32 genera in 12 families, clear indications of a polyphagous diet. However, there appears to be a strong preference for plants in the family Apocynaceae, with at least 17 genera (more than half) recorded. A most probable advantage of consuming potentially poisonous plants in this family would be the chemical defense that the larvae would be able to derive from them. For example, the leaves and other parts of the oleander contain a potent concoction of cardiac glycosides (cardenolides), such as oleandrin, which can cause nausea, vomiting, weakness, irregular pulse and decreased heart rate. The oleander has even been responsible for occasional fatalities in humans. Thus the plants in the Apocynaceae would confer the larvae considerable deterrence against a variety of predators. Beck, J. & I. J. Kitching, 2008. The Sphingidae of Southeast-Asia (incl. New Guinea, Bismarck & Solomon Islands).Version 1.5. http://www.sphin-sea.unibas.ch/. Bell, T. R. D. & F. B. Scott, 1937. The Fauna of British India, including Ceylon and Burma. Moths. Volume V. Sphingidae. London. Inoue, H., R. D. Kennett & I. J. Kitching, 1997. Moths of Thailand, Volume Two Sphingidae. Chok Chai Press, Bangkok. Jarvis, C., 2009. The Linnaean Plant Name Typification Project. The Natural History Museum, London. http://www.nhm.ac.uk/research-curation/research/projects/linnaean-typification/. Pittaway, A. R., 1993. The Hawkmoths of the Western Palaearctic. Harley Books, in association with the Natural History Museum (London), Essex. Stewart, A., 2009. Wicked plants. Algonquin Books of Chapel Hill, North Carolina. van Wyk, B.-E. & M. Wink, 2004. Medicinal Plants of the WorldAn Illustrated Scientific Guide to Important Medicinal Plants and Their Uses. Times Editions-Marshall Cavendish, Singapore. Wasfi, I. A., O. Zorob, N. A. Al Katheeri & A. M. Al Awadhi, 2008. A fatal case of oleandrin poisoning. Forensic Science International. Wee, Y. C., 2005. Plants that Heal, Thrill and Kill. SNP International, Singapore. EXIF info - Aperture : ƒ/10 | Camera : Canon EOS 5D Mark II | Taken : 6 December, 2009 | Flash fired : yes | Focal length : 100mm | ISO : 100 | Location : 12° 55′ 19.761239991788″ N 74° 51′ 57.39768019884″ E | Shutter speed : 1/125s | Images and content Copyright © Krishna Mohan. Please contact me to purchase prints or for image publication license. Thanks, Giridhar Kamath, Arindam Saha for your compliments. In case you find some errors or problems while browsing my blog, please let me know. Glad to see your work. I wish to tell an observation done by me in my childhood. The Caterpillar of this moth always eat flowers of Oleander in addition to new leaves. They get the color of the flowers due to accumulation of color pigments. If it lives on red flower tree it becomes a red colored and in white flower tree you can see it in light green. I think this is a nice way of camouflaging. Thank you for the nice images. I appreciate your opinion. Many thanks for contacting me. I and many of our scientific friends have raised and observed these moths, both in wild as well as in captivity. They don’t eat any flowers. 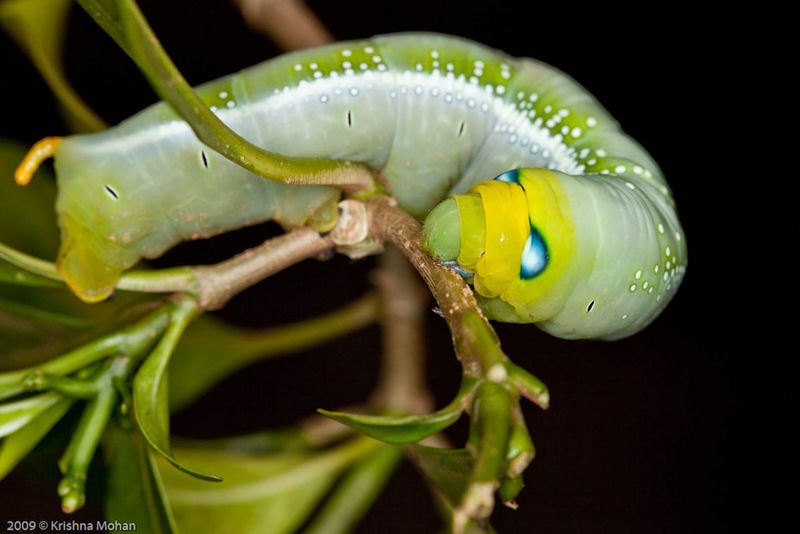 The caterpillars feed on oleander leaves which contains the toxic product which they accumulate within their body. Just to prove this particular caterpillar was on a yellow oleander tree. And as you can see the caterpillar is not yellow. They did not eat any of the flowers of that tree, but fed only on the leaves. 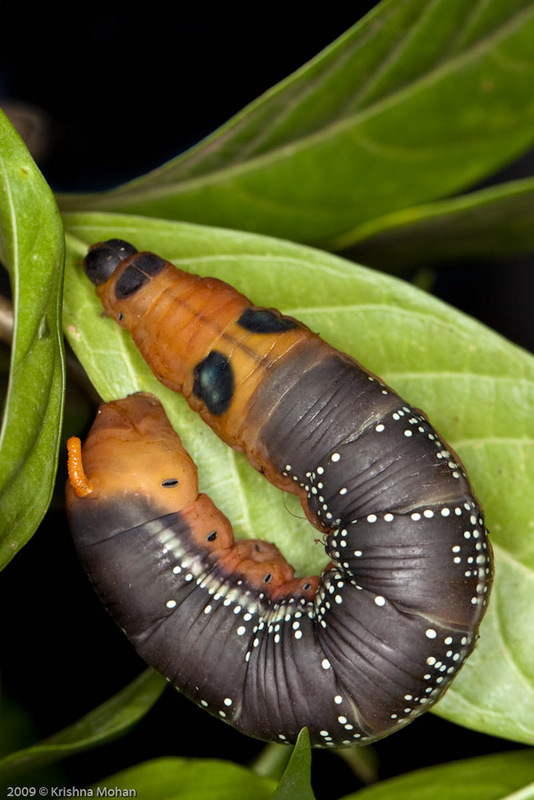 Newly hatched oleander hawk-moth larvae are three to four millimetres in length, bright yellow, and have a black, elongated ‘horn’ on the rear of the body. 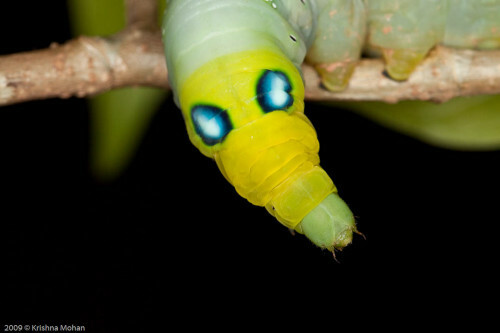 As they get older, the larvae become green to brown with a large blue-and-white eyespot near the head and a yellow ‘horn’ on the rear. There is also a white band along the side of the body, with a scattering of small white and bluish dots alongside it. The spiracles on the sides of the body are black. 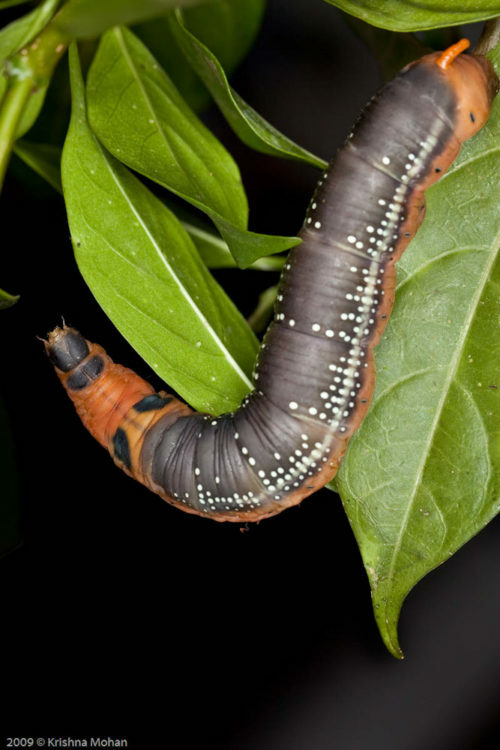 Older oleander hawk-moth larvae measure around 7.5 to 8.5 centimetres in length. Just before it pupates, the oleander hawk-moth larva becomes browner in colour. The pupa of this species measures around 5.5 to 7.5 centimetres in length, and is light brown with black spots and a black line down the middle. If you have really documented eating flowers or color change as a naturalist I would like to prove myself wrong. Kindly provide evidence in the form of photos or preserved specimen of the caterpillar in different colouring as you have stated in your letter. I would like to rectify and improve my knowledge. Until then please don’t add this information to Wikipedia and kindly revert the information you added yesterday which is misleading. I hope you understand my concern as this involves scientific knowledge and not mere observation. 1. Moore, A. and Miller, R.H. (2008) Daphnis nerii (Lepidoptera: Sphingidae), a new pest of oleander on Guam, including notes on plant hosts and egg parasitism. Proceedings of the Hawaiian Entomological Society, 40: 67-70. 3. Leong, T.M. and D’Rozario, V. (2009) Final instar larvae and metamorphosis of the oleander hawkmoth, Daphnis nerii (Linnaeus) in Singapore (Lepidoptera: Sphingidae: Macroglossinae). Nature in Singapore, 2: 297-306. 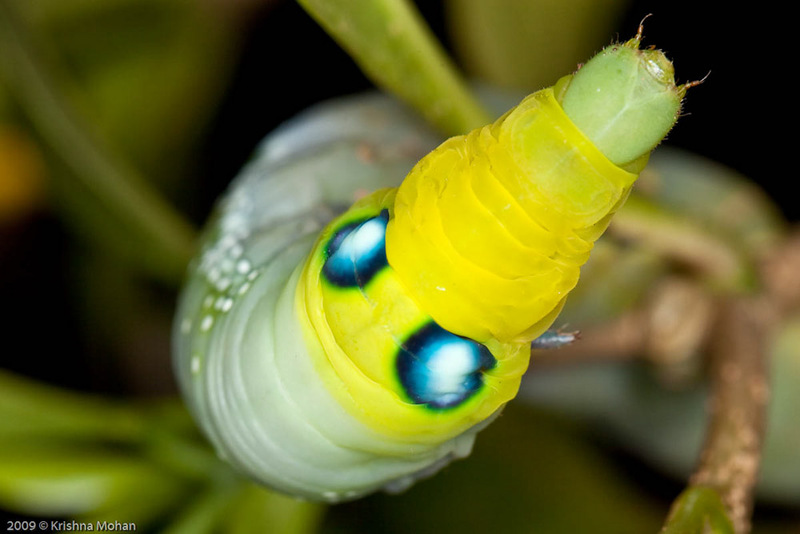 Thankyou for this detailed information on the Oleander Hawkmoth Caterpillar. Presently my garden and the adjoining olive grove here on Rhodes, Greece has many of these. I have a hedge of some 40 or so oleanders and guessed this is what the caterpillars are. Sadly my cats keep catching them and some are injured. I am now looking forward to watching for the moths to emerge. Wow… just found one of those wee beasties, huge! was quite a surprise what the Caterpillar transforms into, the Oleander Hawk Moth is absolutely stunning as is the Caterpillar. Haven’t got to that stage yet though. Found in Indonesia…. I found many of then on our neighbors backyard and as I observed one them are vomiting, and the way that particular caterpillar poop it’s not solid like others because it has some liquid on it, then the next day it’s still alive but it’s kind weak. I want to do someting but I don’t know how because the next morning the caterpillar died, so I want know what happen. I found many of them on our neighbors backyard and as I observed one them are vomiting, and the way that particular caterpillar poop it’s not solid like others because it has some liquid on it, then the next day it’s still alive but it’s kinda weak. I want to do someting but I don’t know how because the next morning the caterpillar died, so I want to know what happen. Dear Dr.Mohan, lovely pics i must say. The caterpillar of the Oleander Hawk Moth on my Nerium oleander plant (which was in full flower) in my terrace garden, i observed did eat all the flowers ( almost whole flower, would leave behind some remainder of a petal at the bottom of the plant ) & emerging buds & new shoots too…It also accepted leaves from another plant variety of pink oleander, top shoot cuttings of which I tied to my plant as my plant was fast getting short of fresh leaves & the single caterpillar was not feeding on the older hardy leaves…fortunately there are many oleander plants in my vicinity. Unfortunately i have not recorded its behaviour to provide the proof..the barren plant bereft of all flowers &buds & shoots, is only proof. Today it has pupated. In your photo journal you mention that in another 10 days the Moth will emerge but in your replies you mention 20-22 days ?..please let me know as I would like to be prepared to witness the emergence of this glorious Moth. Once again thank you for lovely pics & info on this beautiful Moth.